The premise of Evolving Ourselves is simple. Human evolution has not stopped. It has accelerated. We are making unprecedented changes to our world, our lifestyle, our behavior, our environment, and those changes are making unprecedented changes in us. Evolving Ourselves boldly asserts that we are redefining homo sapiens in unknown ways, most of them probably good, and the potential to make further changes to our species is at hand. Virtually all of human history has been intimately tied to nature. People grew up in small villages, rural communities, family farms, surrounded by forests and plains and animals and jungles and dirt. Life was dirty. Even a century ago, fewer than 2 in 10 people lived in cities–and cities were largely dirtier and less sanitary than rural areas. Modern cities would be unrecognizable marvels to our great-great grandparents. Clean, sanitary, with waste disposal and running water and hospitals and health departments. The percentages have flipped, with 80% of Americans living in urban centers and 54% of the world living in cities. Life expectancies have shot up as well, from an average life span in the 40s to one in the 70s through much of the world–in the 80s in some countries. Child mortality is down, overall health has improved, and clearly life is better for many, many people. There are some consequences to these changes as well, though. Allergies are rare among children who grow up on farms, but they are quite common among the more urbane. The cleaner the environment a child grows up in, the more likely she is to have a severe allergy problem. The root causes of autism are unknown (though vaccines have been ruled out), but modernity has brought an epidemic of autism-spectrum disorders with it. Antibiotics and vaccines have conquered many of the killers of previous generations, but they are leading to the evolution of “superbugs” that are resistant to every drug we currently have available. Our divorce from nature has given us longer and healthier lives, but sometimes those lives are also prone to mental disorders that are less common among those who spend more time outdoors. Breastfed babies usually require vitamin D supplements, now, because their mothers do not get enough sunlight. Evolving Ourselves by no means rejects natural selection as the primary driver for evolution. But it accepts the newer understanding that not all changes require multiple generations to manifest. One pivotal study has been done of families in Europe following World War II. When the Germans began losing the war, they subjected some areas to great deprivation. Women who were pregnant during this period of famine gave birth to smaller babies than average. Surprisingly, women who were not pregnant during the famine but still experienced the suffering also gave birth to smaller babies. Decades later, the daughters born to those mothers ALSO gave birth to smaller than average babies. These children were also more prone to other health issues than similar populations without the history of famine. Genetic studies have concluded that the famine changed the way a specific gene operated. This gene and its altered operational instructions both passed to children of those mothers–and despite decades of plenty, the gene and instructions passed again to a third generation. Studies showing that children have been getting larger and populations becoming more obese may be a reflection of similar genetic changes that are occurring. 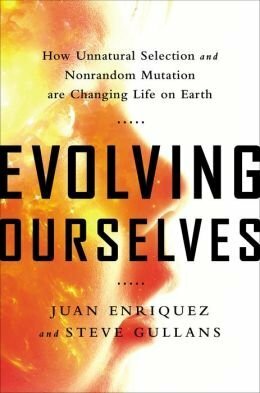 The last part of Evolving Ourselves considers potential futures where humans deliberately rewrite our own genetic code to guide evolution of our species. This is obviously quite controversial, and the authors try to wade carefully through these waters. Some work is already being done to address severe genetic abnormalities that impact lives and longevity. Few would argue with genetic manipulations that would cure diseases in adults and children. More controversial are genetic edits that might “enhance” our bodies or our minds. Do we want designer children, with genetics that give them better athletic or academic ability? Can, or should, we stop this from happening? If/when our species expands to other planets, will we need to genetically engineer those explorers and colonists to endure space, withstand alien environments, and live long enough to succeed? The authors take a very optimistic view toward these things. I am not fully persuaded that we have the wisdom, trust, or fairness to see these changes done well…but I am becoming less confident that we have the ability to prevent it from happening. Gene modification is too appealing, and becoming too easy, and I suspect the genie has already escaped the lamp or will very soon. Evolving Ourselves is written for a general audience with a scientific interest. I found it easy to read, sometimes quite funny, and always very approachable. It is informative and understandable and very, very interesting. I think anyone interested in science, evolution, genetics, and the future of humanity will find it a fascinating addition to their bookshelf.